FAFSA is known as Free Application for Federal Student Aid, is the free online Application for Financial ad Eligible for the College Students (Both Undergraduate & Postgraduate) in the United States of America (What is FAFSA?). FAFSA is the Part of Department of Education In USA, is the largest provider of Student Financial Aid in the Nation and which provides more than $150 billion in student aid each year. FAFSA is responsible for managing the Student Financial Assistance Programs which Includes grants, work-study, Federal Student Loans, and even State and School Financial Aid. The Student Financial Aid is the funding that is available exclusively to the Students attending post secondary educational Institution in the United States. This funding is to assist in covering the many costs incurred in the pursuit of the Post-Secondary Education. Financial aid is available from federal, state, educational institutions, and private agencies (foundations) and in order to apply for any Federal Financial Aid students must first complete the Free Application for Federal Student Aid (FAFSA). FAFSA is used by aid providers to determine the amount of the student’s Expected Family Contribution (EFC), which is the amount that they expect the student’s family could contribute toward the Student’s College Education. EFC varies from student to student since it is based on the specific Financial situation of the student and often of the student’s parents as well. The FAFSA often cover various areas such as the student’s family situation, the student’s educational background, the student’s educational plans, and prospective colleges, the student’s finances, the student’s spouse’s finances, and the student’s parents’ finances. Whether or not parent financial information is required depends on whether or not the student is determined to still be a dependent of one of their parents. Is a U.S. citizen, a U.S. national, or an eligible non-citizen. Has a valid Social Security number. Sign the certification statement stating that you’re: 1) not in default on a federal student loan and do not owe money on a federal student grant and 2) federal student aid will only be used for educational purposes (this means no trips to Cabo Wabo to see Sammy Hagar). Has not been found guilty of the sale of illegal drugs while federal aid was being received. (Possession was dropped in 2010, but I still wouldn’t recommend getting pinched). Has registered with the Selective Service System (for Conscription in the United States Armed Forces) between the ages of 18 and 25, if required to do so (females are excluded from this requirement). Begin your FAFSA process by creating an FSA ID at FAFSA Website (FAFSA.gov). It’s your personal code for submitting the FAFSA when you’re ready. Your FAFSA ID will give you access to FSA online systems and can serve as your legal signature. Submit your FAFSA Application as soon as possible. 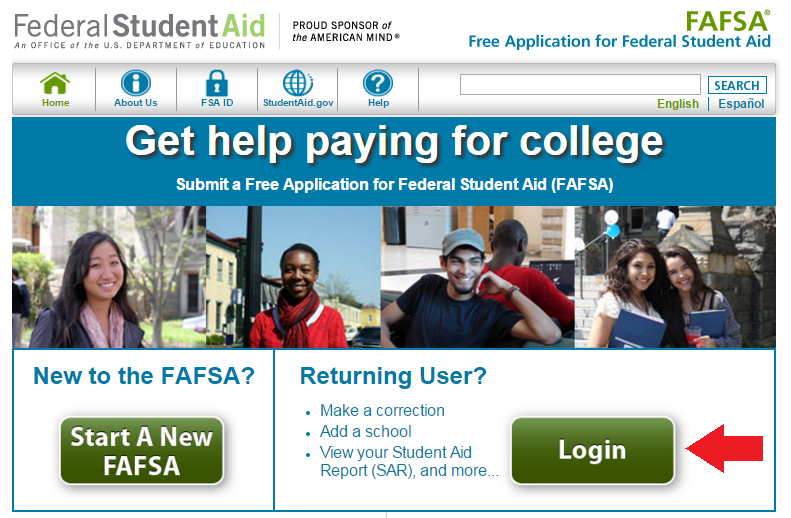 Federal student aid applications can be submitted starting October 1 at FAFSA.gov. Federal financial aid is awarded on a first-come, first served basis, so know your deadlines and apply as early as you can to maximize your financial aid. Apply for FAFSA annually. You need to fill out the FAFSA each year that you are—or plan to be—a student. The FAFSA is used by schools to put together your financial aid package for one year of college. In order to file your FAFSA Application you’ll first need to collect all the documents you’ll need to reference. Then complete your application by registering the FAFSA Form through the Website at FAFSA.gov. For example, if you’re applying for financial aid for the academic year 2017-18, you’ll likely use your family’s 2015 tax return. Don’t fall for scams. The only site you should use to fill out and file the FAFSA is FAFSA.gov. When you fill out your FAFSA Application you have to provide the personal demographic information, as well as Financial Information which includes your family’s Federal Income Tax Returns, W-2 forms, Bank Statements, and information on your Family’s Investments. This Financial Information is used to determine your Expected Family Contribution (EFC). Your EFC is an Index Number that colleges use to determine how much Free FAFSA Federal Financial Aid you’re eligible to Receive. Your EFC is calculated according to a formula established by law and the information from your FAFSA. The government considers your Expected Family Contribution (EFC), your year in school, your enrollment status, and the cost of attendance (COA) at the school you’ll be attending to determine your financial aid package amount. The COA is typically tuition, books, supplies, transportation, room, and board. After you submit your FAFSA, you’ll get your Student Aid Report (SAR) from the office of Federal Student Aid. Your SAR is a paper or electronic document that gives you basic information about the FAFSA data you submitted, including your answers to the questions on your FAFSA. Your SAR won’t tell you how much financial aid you’ll get. If you provided an email address when you submitted your FAFSA, you can expect to receive your SAR within a few days of electronically filing or within two weeks of mailing. If you made a mistake on your submitted FAFSA, you can make corrections by logging in to your account on FAFSA.gov. Once you’re logged in, enter your FAFSA ID to change your information and submit new information. You can also update your mailing address, email address, and other contact information in your account if it has changed. The FAFSA Deadlines can be changed depending on whether they are federal or State Applications, so it’s important to be able to decipher between them. The FAFSA Deadlines can be varied by state and it’s easy to remember the federal Financial Ad application Deadlines because it will be the same for everyone (June 30, 2019). The FAFSA becomes available on October 1 and has an 18-Month application Cycle. In addition to complying with the Federal deadline, Students must adhere to state Financial ad Deadlines as well as in order to qualify. Looking for your state’s specific deadline? Don’t worry! We’ve got you covered with a complete list of financial aid deadlines, state-by-state, for the 2018 – 2019 academic year. The Federal Aid Deadline for the 2018 – 2019 academic year is June 30, 2019 – no matter what state you live in. 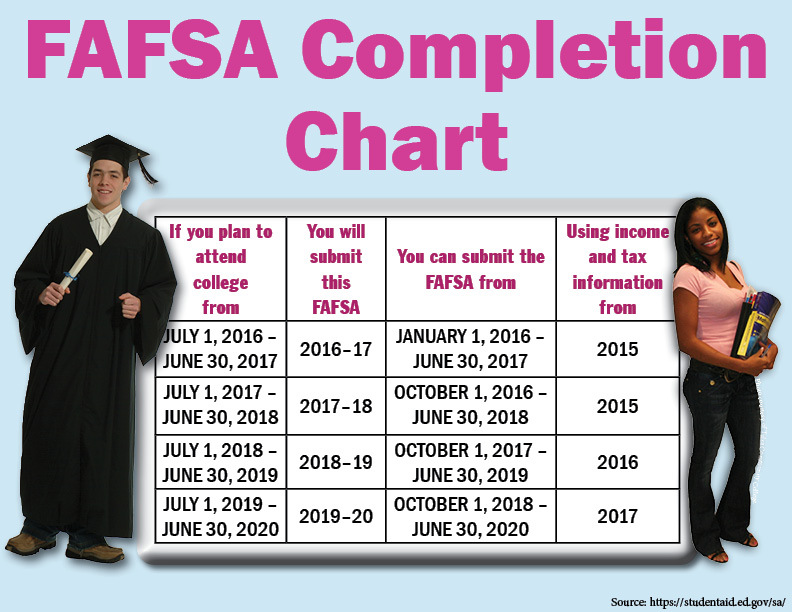 FAFSA on the Web applications must be submitted before or by midnight, 12:00 a.m. Central Standard Time on June 30, 2019. Additional form may be required. Contact your financial aid administrator or your state agency. Applicants encouraged to obtain proof of mailing. For priority consideration, submit an application by date specified. Deadline by midnight, Central Daylight Time. Deadline by midnight, Central Standard Time. The deadline may be by date received, date postmarked or date form was processed. Question 1: My family’s income is too high to qualify for federal financial aid. Answer 1: Student and family income isn’t the only factor that the government uses to decide if a student qualifies for federal financial aid. The only way to know for sure if you’ll qualify is to fill out the FAFSA. Question 2: My family has money saved for college so we won’t get any federal financial aid. Answer 2: Savings might not be a major factor when a school decides if a student qualifies for Federal Direct Unsubsidized Loans. There are allowances for savings and assets. Question 3: My sibling wasn’t eligible for much federal financial aid last year, so I won’t be eligible when I enter college. Question 4: I’m only attending college part-time, so I won’t be eligible for federal financial aid. Answer 4: Financial aid is available for part-time students. Talk to the financial aid offices of the colleges you’re interested in attending about aid for part-time students.